OM SAI RAM Beloved Bhaktas of Lord Sathya Sai, Embodiment of all that is gloriously divine! My daughter, Kendra and I celebrated Ram Navami today, at the Yoga Shakti Ma ashram. The day robed itself in azure blue veils and soft white saris, bowing low to kiss the golden feet of the sun as it rose on this auspicious and venerable day. the porcelain, divinely beautiful idols of Lord Rama, Mother Sita, Sri Lakshmana and Hanuman. We all sang sweet bhajans remembering and recalling sacred stories of the Crown jewel of the Solar dynasty, Lord Ram. During bhajans my daughter Kendra suddenly turned with a shock towards the resplendent figure of the Goddess Durga. There reposing at Her lotus feet was a huge, radiant Shiva Lingam. This majestic Lingam was obviously very special. Later we learned why from Shyama, the Mataji of the ashram. According to Shyama the Lingam came from the Narmada river in India. Apparently an American who lived not far from the ashram bought this Lingam from Sotheby's. It is reputed to be between 800 and 1200 years old and comes from a meteorite that fell from the heavens. When this American fellow passed away, his brother inherited the Lingam. Not knowing what to do with it, some devotees suggested he donate it to the ashram. As the bhajans came to a conclusion with the dazzling lights of Arathi, I closed my eyes and saw a very wonderful vision of the Goddess Durga astride Her lion moving through the temple. 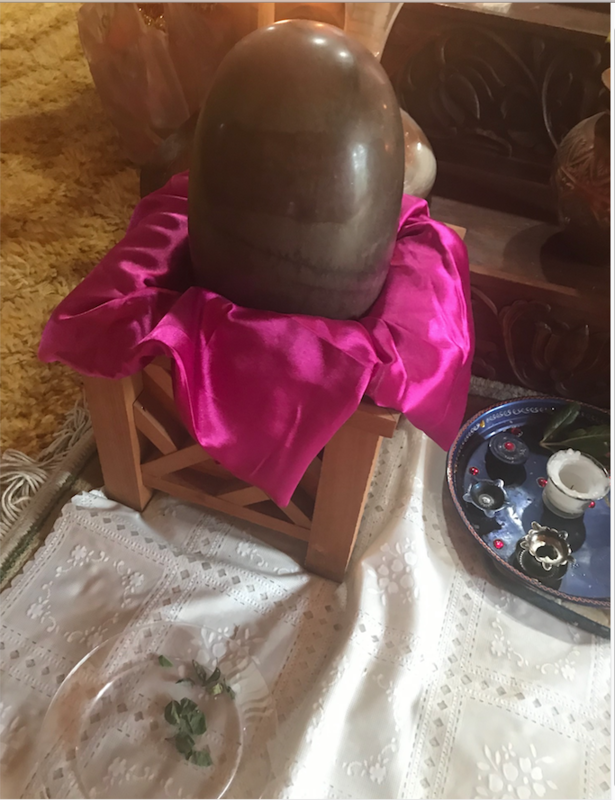 Later, Kendra and I were thrilled to touch this celestial Lingam on this holy, blessed day.